Just because we’ve lost our Easter virginity doesn’t mean we have to succumb to the whole chocolate conspiracy. So I adapted a thermomix Vitality Truffle recipe and made these little dried fruit eggs for the kids. 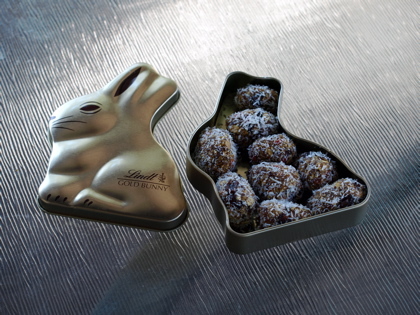 I put them inside 2 gold Lindt bunny tins that I was given by swimming students. Don’t ask what happened to the contents, my kids are too young to know they were once filled with delicious if unethical chocolate. Blend for 1 minute on speed 7 in thermomix. Or blend in batches in food processor until well combined. Roll into egg shapes and roll in shredded coconut.